Is it just me or is Twitter exploding right now? Apart from noticing that I got more followers the last days, I’ve also noticed that several Twitter services such as Tweetburner and Mr. Tweet has been down for maintenance. That might be a sign of overload! At a seminar I attended last week on Social Media one of the speakers Johan Ronnestam said that the reason Twitter is exploding right now is Barack Obama successful use of it during his election campaign. Every marketer worth his salt has now studied the phenomena and is busy trying to get everyone at their companies to use Twitter. If you want to join the trend, follow me on Twitter! 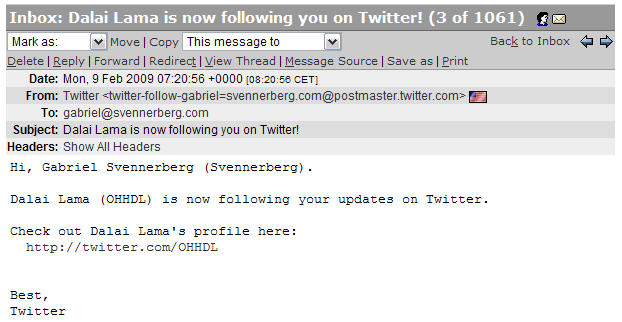 Dalai Lama is now following me on Twitter! Even though I realize that it’s probably not Dalai Lama himself following me but rather someone administrating it for him, I can’t help thinking that it’s pretty cool! Dalai Lama was apparently a fake. That’s too bad because he was quickly becoming the most popular person on Twitter. Read all about it at the Next Web. C’mon. Did you REALLY think it was the Dalai Lama? I’m surprised at how many people fell for it. Not because it’s a dead easy thing to fake. But because so many people wanted to follow him! I never knew Bhuddism was so popular in the west. I kind of wish the charade had gone on for longer. Well, I have to admit that I really did. Not him in person, but maybe someone on his staff or something. Although in hindsight it seems naive, I think I was blinded by the fact that so many people are recognizing Twitter as an important information channel after Obamas triumph. It’s a very interesting phenomena though that the charlatan managed to become among the most followed persons on Twitter in just a couple of days. I don’t think it’s because of the Bhuddism thing so much as him being a really famous person. I wonder what other persons one can fake and get the same result?